“No, I ain’t!” cried Tom, as loud as he could; for he did not like to be called bad names. “It is a water-baby!” cried Ellie; and of course it was. “Water-fiddlesticks, my dear!” said the professor; and he turned away sharply. There was no denying it. It was a water-baby: and he had said a moment ago that there were none. What was he to do? He would have liked, of course, to have taken Tom home in a bucket. He would not have put him in spirits. Of course not. He would have kept him alive, and petted him (for he was a very kind old gentleman), and written a book about him, and given him two long names, of which the first would have said a little about Tom, and the second all about himself; for of course he would have called him Hydrotecnon Ptthmllnsprtsianum, or some other long name like that; for they are forced to call everything by long names now, because they have used up all the short ones, ever since they took to making nine species out of one. But—what would all the learned men say to him after his speech at the British Association? And what would Ellie say, after what he had just told her? 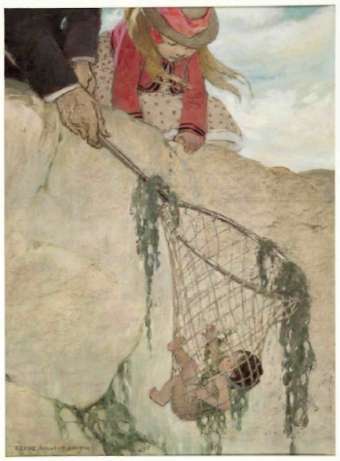 There was a wise old heathen once, who said, “Maxima debetur pueris reverentia”—The greatest reverence is due to children; that is, that grown people should never say or do anything wrong before children, lest they should set them a bad example.—Cousin Cramchild says it means, “The greatest respectfulness is expected from little boys.” But he was raised in a country where little boys are not expected to be respectful, because all of them are as good as the President:- Well, every one knows his own concerns best; so perhaps they are. But poor Cousin Cramchild, to do him justice, not being of that opinion, and having a moral mission, and being no scholar to speak of, and hard up for an authority—why, it was a very great temptation for him. But some people, and I am afraid the professor was one of them, interpret that in a more strange, curious, one-sided, left-handed, topsy-turvy, inside-out, behind-before fashion than even Cousin Cramchild; for they make it mean, that you must show your respect for children, by never confessing yourself in the wrong to them, even if you know that you are so, lest they should lose confidence in their elders.